Ever wonder how an electronic kitchen timer circuit works? 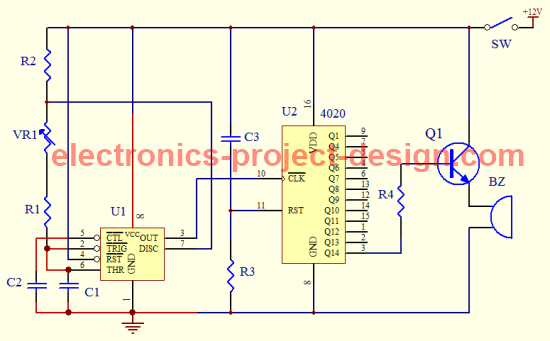 This project can be used to design a timer that will on a buzzer from 1-10 minutes or 10-100 minutes by changing the values of the timer capacitor. It uses a 555 timer integrated circuit configured as an astable mode with frequency that can be changed by changing the values of VR1 and capacitor C1. The circuit uses a 12V DC power supply with the capacitor value of 0.1uF for a timer duration of less than 10 minutes. If longer timer of up to 100 minutes is required, use a 1uF electrolytic capacitor for C1. The frequency generated by the timer is given by the equation below. This clock pulses generated are then fed into the CLK input of the binary counter. This binary counter will count the number of input pulses and generate the output Q14, Q13 ..... Q5, Q4, Q1 accordingly. A negative edge pulse signal from the output pin 3 of 555 timer to the Clock input of 4020B Binary counter will increment the sequence. When the RESET pin of 4020B is applied with a HIGH input, the counter will be reset to zero. The outputs from Q14.... Q1 can have a binary values from zero to 3FFF(Hex) or 16,383(decimal). For example, if the clock input has a square wave frequency of 1 Hertz, than every 1 second will increase the counter by 1. If the frequency is set to 10 Hz, every 0.1 second will increase the counter value by 1. In this circuit, only Q14 is used to activate the buzzer. Hence, 8192 pulses would have passed before it turns on the transistor Q1 which will turn on the buzzer. For example, if the CLK frequency is 10 Hertz (period T=0.1sec), the buzzer will sound 8192 X 0.1 seconds later. 819.2 seconds is about 13 minutes. By adjusting the values of VR1, you will be able to adjust the timer between 1-10 minutes. If you require a longer delay, change the capacitor C1 from 0.1uF/25V to an electrolytic capacitor of 1uF/25V. This change will help to increase the timing as the frequency is now 10 times lower than the previous circuit. A 1 Hertz frequency means the duration of the pulses is now longer i.e. the period T= 1 second. Hence by adjusting the value of VR1, you will be able to change the timer to between 10-100 minutes.